There is nothing like adventuring through Australia. Across almost three million square miles there are untold secrets waiting to be found and some of the most stunning views on Earth to be seen. And what could be better than sharing those magical experiences with another person? Not only is travelling with another person safer, it’s also way more fun (most of the time!). Some people are concerned that this can become complicated from a logistical perspective though. Accommodation may be unavailable or expensive and a caravan could sometimes be seen as too restrictive. This is where double canvas swags come into the picture. 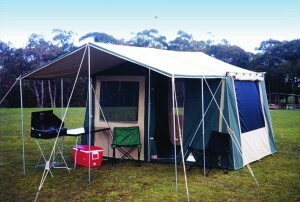 These lightweight and convenient swags are also available for two people. 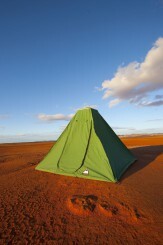 This means that two people can sleep in absolute comfort anywhere they like while remaining safe, dry and comfortable. We offer a selection of double canvas swags and we are here to tell you why these are the best you will find. There are a lot of swags out there, but they can be worlds apart when it comes to quality. Don’t put yourself and your travelling partner at risk for the sake of making small savings: go with the best and never look back! Our swags are made to be comfortable and spacious. You will find that our swags have been designed to accommodate for two people perfectly and once you’re inside, you’ll discover a world of space. With that said they are still easy to fold and transport. This makes it convenient to get around, unpack and pack back up once your amazing rest is over. Our double swags come in three configurations: dome, enclosed and flat. This means that there’s something for everyone according to their exact needs and specifications. If space and roominess are important, then our dome option is a great choice while enclosed swags offer a closer fit. Our swags can also be adjusted and customised to fit your needs. There is a range of accessories available too that can truly tie your swag together and make it a perfect addition to your outdoor equipment. With two people in a swag, there will be a lot more movement and the potential for weaker swags to become torn and damaged. Not with our durable and high-quality swags. Each and every single one of our products is the result of decades of experience and a relentless pursuit of quality. 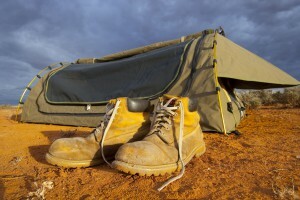 We only ever use the best Australian canvas and we have a talented assembly and manufacturing team. In fact, we are always delighted when yet another customer tells us that their swag has lasted for decades! All of these elements considered together make our swags the best out there. If you like the idea of sleeping in absolute comfort and safety alongside your fellow traveller, then don’t hesitate: get in touch with us today and find the perfect double canvas swag for sale. You can browse through detailed product descriptions on our website.